I am a graduate of Palmer College of Chiropractic West and practice a patient-centered (one on one) approach to physical medicine with an emphasis on combining specific treatments. This includes spinal and extremity adjustments along with soft tissue treatments to address problems with muscles, tendons, ligaments and nerves for faster recovery. I am experienced with numerous chiropractic techniques and rehabilitation exercises in order to address the many individual needs of patients. I am skilled in the treatment of injuries or movement dysfunction not only with high-level professional athletes, but also the average local sport enthusiasts-both the weekend warriors and the beginners. Though I treat a wide variety of conditions, my specialization lies in treating the low back and lower extremity injuries especially the feet. If you could sum up in a few words what I do, the most apt definition would perhaps be “complementary sports medicine". Complementary sports medicine uses a hands-on approach, through specific therapies, assessment processes, and work with many other aspects of the patient's lifestyle and exercise training. More time is spent with the patient in assessing, treating and educating. Sometimes another specialist is needed and that is why I have developed a network of physicians, naturopaths, physical therapists, nutritionists, yoga teachers and trainers to work concurrently with me. My focus is at least as much on the functional aspect and movement of patients as on their specific injury or condition of ill health. I often adopt new information from clinical research and work done by professionals in various fields to explore new areas of treatment when working with a patient. 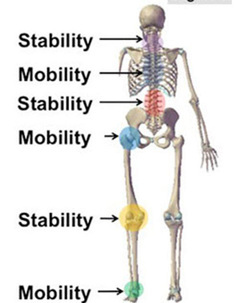 Our whole body is a kinematic chain that acts as one complex functional unit. A complementary practitioner working with a runner who has chronic low back pain considers many factors beyond the low back. Whether this pain is due to a muscle imbalance, ligament sprain or strain, or subluxation, the back pain itself may be an end result of a variety of imbalances that could have developed over a long period of time.